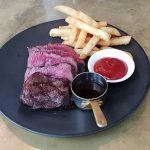 Pre-Christmas lunching in Sydney can now offer a rare combination of quality dining at affordable prices with the Tank Stream Hotel’s Le Petit Flot restaurant, offering world-class Wagyu rump beef at just $15 a dish for midweek lunches. Le Petit Flot will deliver Carrara 640 Wagyu rumps from Kilcoy Global Foods in northern NSW to diners, accompanied by jus and crispy chips, with side dishes such as coleslaw, garden salad or grilled corn priced at just $5 a dish. The high-end 5+ score Wagyu with world-class genetics is usually positioned in the market as a luxury item and is considered one of the best eating experience Kilcoy Global Foods has to offer. The name Carrara is inspired by the intricate and feathery patterns found in Italy’s Carrara marble – distinguished as the world’s finest. The intense marbling is achievable only through first-class genetics. Carrara elevates the buttery texture and delicate marbling synonymous with Wagyu to exceptional new heights. Le Petit Flot’s restaurant manager, Milos Obradovic, says that with the restaurant in the heart of Sydney’s central business district it attracted diners who wanted to enjoy a meal in a refined, but casual, atmosphere. 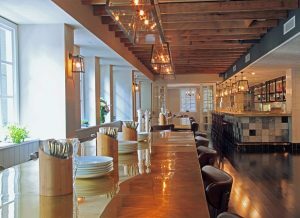 “We are a bistro-style restaurant, with a very relaxed setting that allows diners to enjoy a good conservation over some high-class dishes,” he said. “We have just introduced the Wagyu special offer and it has already proved popular with regular and new diners. It’s not a huge or heavy meal, but incredibly tasty, and even with a glass or two of wine, represents tremendous value for the quality of the product and the elegance of the dining space. The Wagyu special offer is in addition to a full a la carte menu available at lunch and dinner. Le Petit Flot is located on the first floor of the Tank Stream Hotel, which is on the corner of Pitt Street and Curtin Place, overlooking Australia Square.